When it comes to long days on the road, Washington, Oregon and Idaho all sport excellent scenic byways that can be connected together by you, the rider, to create several days in each state of scenic riding and wonder. Our Scenic Byways series will provide you some food for thought as you plan out your next adventure. We begin with Idaho which boasts 28 of them. In this first part of the series, we ride four. After an eight-day trip to Salt Lake City via Oregon and a few hundred miles of interstate, I was ready to head back to Seattle. The interstate part was not appealing. After reviewing my atlases I set a course in my GPS to wind through a series of four of Idaho's scenic byways making my way northwest back to�the Northwest. Of course the departure from Salt Lake would require several hours on I-15 to get to my launching point in Idaho. Well � I guess that's as good of an excuse as any to work on rounding the tires out later in the day with a little canyon carving. It was mid-August and I recall a gas stop near the state line where someone asked me if I was on my way to Sturgis. "Ahhh, not me" I replied as I rode off on my Yamaha FZ6. I hit my junction for SR 26 at Blackfoot in the late morning and headed for Arco where I stopped briefly for lunch at a fuel stop. I had been looking forward to my next stop, The Craters of the Moon National Monument for sometime now. At CotM I entered the park, stopped into the visitor's center, paid the fee to ride through the monument and the FZ6 and I toured the area for about an hour. More time would have been nice, but the camera was busy picking up the sites, and the memories live on. Smoking lava tubes, craters rising out of the landscape and a geology lesson here and there provided a quality time at a stop worth making. It was now early afternoon and I made my way toward Ketchum, picking up my first scenic byway of the four I had chosen to link together, The Sawtooth Scenic Byway. In Ketchum I stopped for a break to look around and see a ski-crazy town in full swing with summer visitors. It's a nice place to visit and in summer it's bright with color that you wouldn't see in the black and white of winter. North on SR 75 I headed as I ascended high into mountains enjoying every corner the road had waiting for me. I don't recall there being much other traffic and the higher I rose, the broader the landscape below became. I reached Galena Summit at 8,701 feet, pulled the bike over, took in the view and snapped a few photos. It was cold up here at the higher elevation and I donned my rain jacket to retain my body heat. Descending down northward from the summit, there lay the Sawtooth Range to my left, which literally looks like the teeth of a flat saw used for cutting large trees a few hundred years ago. I didn't know it then, but I now know this area was recently used to bring back a strain of grey wolves that had long vanished from the area. The region is a playground for hunters and fishermen, that is until the snowy days of fall set in. The byway ends at the junction for Stanley. At this point I made a left and was on my next link, The Ponderosa Scenic Byway. Here you wind your way through the forest northward wrapping your way around the end of the Sawtooth range and then heading southwest down Canyon Creek. Crossing over Banner Summit wasn't quite as chilly with the elevation being just 7,020 feet. The air warmed the further down I rode. Today I would skip the lower half of this byway in an effort to connect with the next on my list, the Wildlife Canyon Scenic Byway. 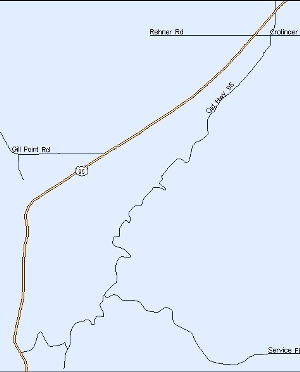 But if you have the time, make the ride toward Boise as the twisties really pickup along Beaver Creek just past the junction for County 24. Along the Wildlife Canyon Scenic Byway, there are pullouts with plenty of explanation about the area. Keep your eyes on the South Fork Payette River as you ride and you'll no doubt see kayakers, rafters and other waterborne recreationalists enjoying the rapids that continue to grow as the river picks up speed. Besides a fledging elk population, mule deer, whitetail deer, chukars, wild turkeys, eagles, ospreys, cougars, bears and wolves are abundant in this canyon. The region becomes more sage-like and arid and in the summer it's not uncommon to come across one or more wild fires along this area. The byway ends at Banks on Highway 55 and I turn right to proceed north along my final byway for the day, The Payette River Scenic Byway. 55 is a simple ride, not too much in the way of technical riding involved but it's the end of a long day and my mind starts to wander as I contemplate evening accommodations. After 500 miles I pull into Donnelly and inquire about a room, having camped the last 8 nights in a row. "You must be kidding," replied the night man. "We have the fair going on this weekend, there's not a room for 50 miles." I could have camped nearby, but I was determined to get a nice sleep away from the fair crowd. Northward I rode into McCall where the large, lovely Lake Payette resides. I stopped at a restaurant, The Mill, and was wooed by the old time hospitality and quality of the food and drink selections. During dinner I decided to head another 25 miles north to Riggins and seek out a room. At New Meadows, the end of this scenic byway, I blew my connection with US 95, heading south instead of north. After a few miles the GPS made it apparent I had erred. I turned around, retraced my steps and made the correct move when I hit New Meadows. It was now dusk and with a long day behind me I was working overtime and running with my deer radar cranked up. I saw several shadows hopping and it was good to hit Riggins after a 500 mile day unscathed. I enquired about a motel room � "one left" said the night manager throwing the switch on the 'No Vacancy' sign. The morning was clear with the exception of some smoke that was wafting through the area in a state that was dealing with no less than 14 wildfires that day. I headed north up US 95 paralleling Hells Canyon which was just to the west. There's not much about Hells Canyon you can see until you travel up it in a boat, but that's another trip. The ride up 95 proved to be a true pleasure with plenty of tasty road engineering along the Salmon River. At Whitebird, I pulled out to photograph two two-point bucks. My attempts at accessing the camera spooked them and so they fled. But I tricked them. After riding north a mile, I turned the bike around and came back down the hill. The bucks were back to normal grazing and this time I pulled out and got the photos I had hoped for on the first try. I rode back up Whitebird Hill and at the top, pulled out and looked east across the Nez Pierce Whitebird Battlefield. I noted an extremely twisty stretch of road below, the old 95 road which appeared accessible. Next time I'll do it. At left: Take the new road or the old road? Don't miss the old road.